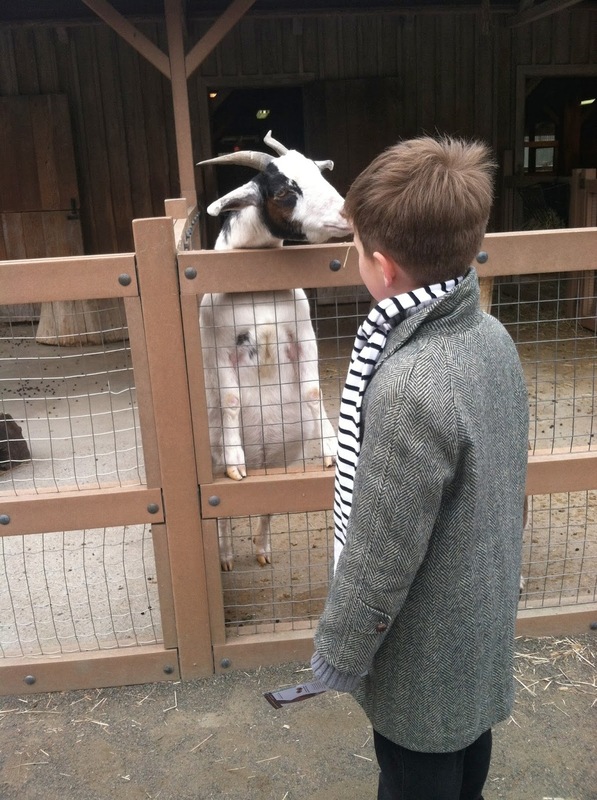 When the boys toddled around, weighed down by infrequently changed Pull-Ups, and still occasionally now, we stop by the barn at the Prospect Park Zoo. Spend enough time in petting zoos and you will A) lose your mind B) contract an animal-borne illness because you neglected to use the hand sanitizer provided or C) gain valuable insights into human nature. (A and C so far for me). Insert 2 quarters, dial up a palmful of compressed hay pellets and head for the pens. That’s my limit by the way: 50 cents worth of family fun and slobber. If they want more, I make the boys scrounge for fallen kibble. I think they like this part best, down in the dirt. If I could get away with it, I would sneak the wooly beasts heels of bread, but there are docents milling about. Feeding gluten-rich crusts to domesticates and water fowl is a big no-no. Even if I get around the docents, my boys know this no-no and are the worst enforcers. They would turn me over to the rangers in bermuda shorts in a little boy heartbeat. But I’m just not convinced Tom Turkey’s gizzard will explode if he pecks at an organic crumb of pumpernickel, priced at $4.39 per loaf. Ever try to feed a Cotswold sheep with a goat standing by? Guess who gets the pellet from your palm? Goat muzzles out sheep every time. 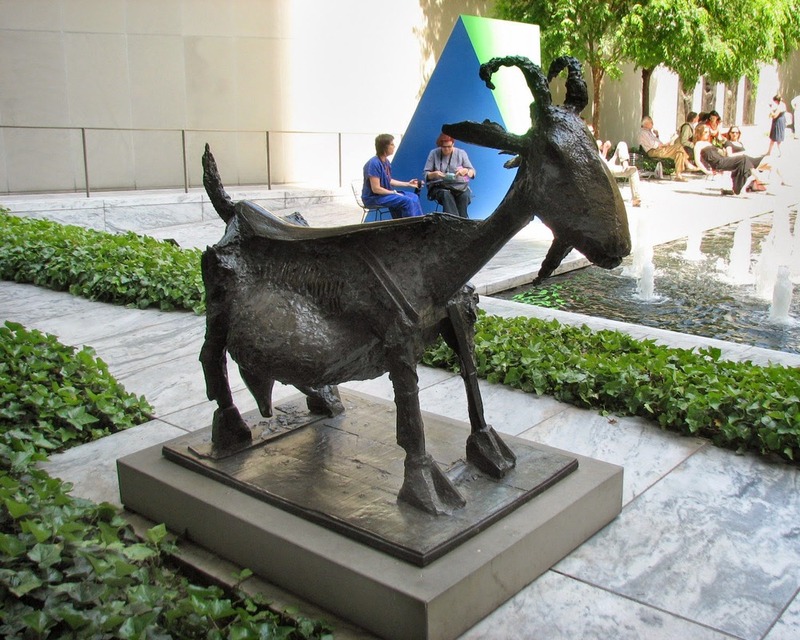 As a kid, my favorite sculpture in the MOMA garden was Picasso’s She-Goat, a sway back, proud, pregnant goat with enormous teats. No coincidence there. Picasso strikes me as a randy, bearded billy. I love Picasso and I love goats, with their weird vertical iris, asymetrical markings and endearingly insistent natures. I love how they frisk up to the fence with a “Wassup?” Makes my day. It was in watching this bully billy, on a recent Sunday afternoon, that my barnyard epiphany hit me: the personalities we attribute to individual animal species can be reduced to single traits. Sheeps are sheepish, lions are leontine, and goats are, well, rascally, old goats. True to their natures, this old goat muscled out Mary’s little lamb, who backed away without a bleat. Yet here’s the crazy thing: this Noah’s ark of personality traits that manifest individually in our furry, scaly and feathered friends, floats within our single species. Homo sapiens exhibit a wild range of disposition, from self-effacing sheep to proud peacocks, from faithful dogs to fickle felines, stealthy scorpions to stupid asses. Zookeepers who dish out yams daily in the baboon habitat may rightly object to my generalization, pointing out that there are braggarts as well as cowards within this old world monkey family. Yet hide for hide, kittens are basically skittish, wolves wolf down their dinner, and baboons bear teeth, flaunt red butts and generally monkey around. Ask yourself: why are humans so different, one from the next? Why are your kids so different? Why aren’t we all bearish or dovelike? My spin? Just another example of an inscrutable intelligence at work. It takes all types and a breadth of talents, to fill the jobs that keep this planet spinning. We need them all, the goats and sheep, wolves and owls, and especially the doves. (We can lose the slumlord cockroaches). I know God exists because for every job on this planet there is someone to do it. Some kids actually want to grow up to be phlebotomists. They see the reward of painlessly puncturing a hidden vein. Or how about offensive linemen? Plenty of boys want to grow up to be knocked down, again and again. And tourists everywhere. Eurotrash in expensive loafers pound the marble floors to see sulfide chimneys and duck-billed dinos. In its third century of existence, the museum swims along in its talent pool, a cultural triumph, a self-sustaining tourist trap. I just gotta believe there’s a divine intelligence sparking the solar plexus of each individual, igniting our passions, guiding our vocations. The crossing guards ferry our children across 4 lanes of traffic, the entertainers lighten our load, the philosophers and shrinks make sense of it all. It’s not our superior intellect that gives us the edge over those that creep, cantor, fly or swim. It’s our varied temperaments that define our success as a species. The next time you find yourself in a room full of personalities, at a cocktail party, or PTA meeting, remember this: where would we be without the goats and the sheep and everything in between?